Welcome to a new year! I love new beginnings and fresh starts. I love the new path of a new year, a new month, even a new day. And what else do I love? New projects! So today is Day 1 of my new 365 project. It's something I've been wanting to try for a few years to help me keep track of all the cooking, gardening, knitting and roofing projects that go on around this house. 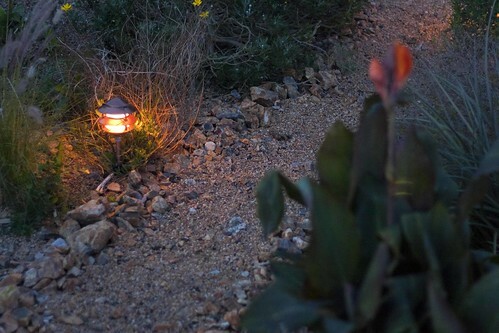 These garden lights and rock landscaping were an unexpected yet completely needed project during 2010. With the incredible productivity and drive of my husband's mother, -- who doesn't like when I keep calling her my mother-in-law, so I suppose since she spent FIVE WEEKS with us in 2010 I could start calling her by name on my blog -- Pauline moved bucket after bucket full of roof rocks from piles on our patio down to landscape our garden beds. And I didn't take a single photo of her! That's why I need a photo-a-day project. I love the results of her efforts more than I could have imagined. 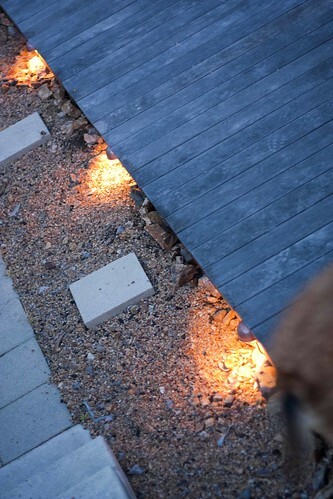 The new landscaping also motivated Thomas to install low-voltage garden lights along the new dry riverbed path, along the deck edge and up the patio staircase. 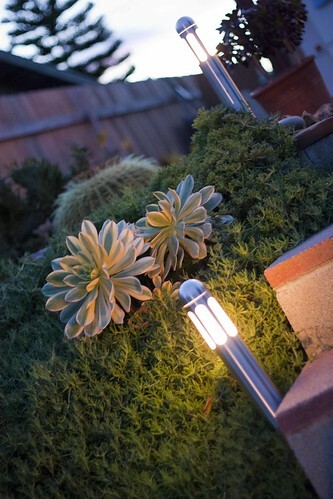 Every time I go outside I feel like it's a new garden. Day or evening. Thank you, Pauline. Now it's time to dream about what we will get ourselves into in 2011. And I promise to provide photo evidence!